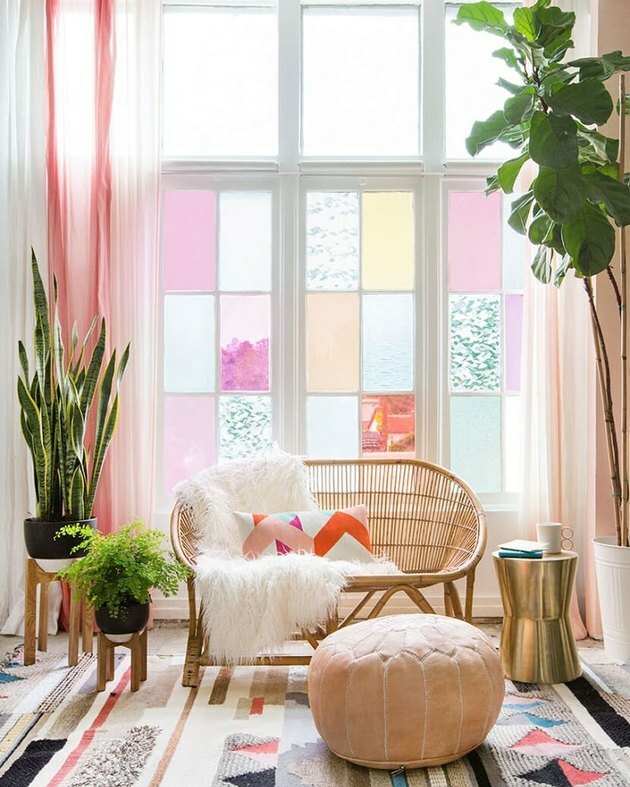 It's clear that the millennial pink trend isn't going anywhere in the near future, thanks to millennials and non-millennials alike who continue to swathe their living spaces in an array of rosy hues. There's just something about the blush shade that seems to go with nearly any style of decor. 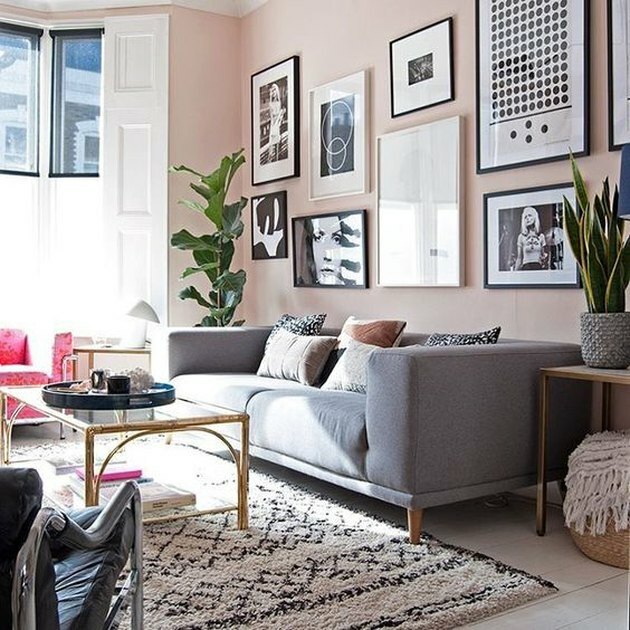 Pink tends to be a "notice me" shade, which is why it's particularly unexpected in a living room, where traditionally the color palette errs on the side of caution in more neutral hues. However, it can also work as a neutral in its own right. 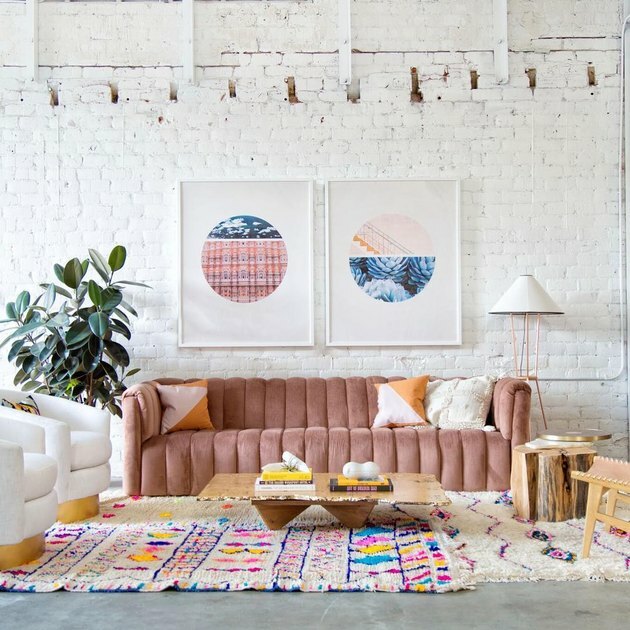 So whether you choose to coat your living room walls in pink paint or you want to start slow and jump on the bandwagon with a few simple accent pieces instead, these 15 pink living rooms are sure to inspire a memorable makeover. 1. Cover the room from top-to-bottom. 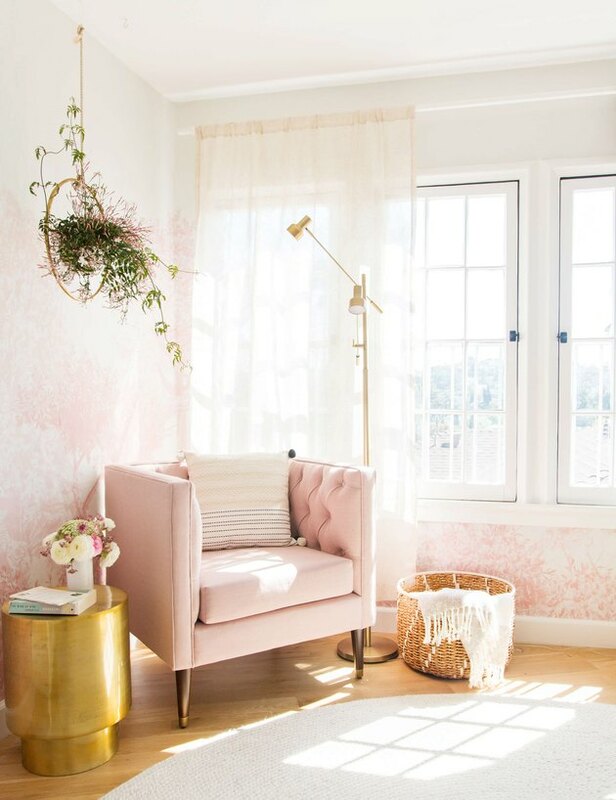 Pink can bring a warming quality to a room just by adding rosy furnishings that mesh flawlessly with rose gold metallics, light wood finishes, and rattan accent pieces. 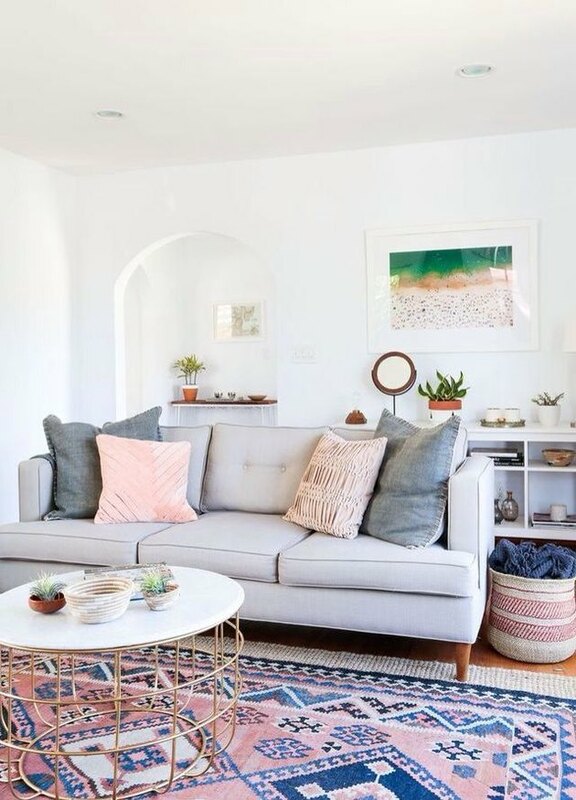 This living room belonging to Kate Spiers from Kate La Vie is an excellent example of this, spotlighting clean lines and natural materials, all basking in a cozy peach glow. 2. Mix in shimmering golds. 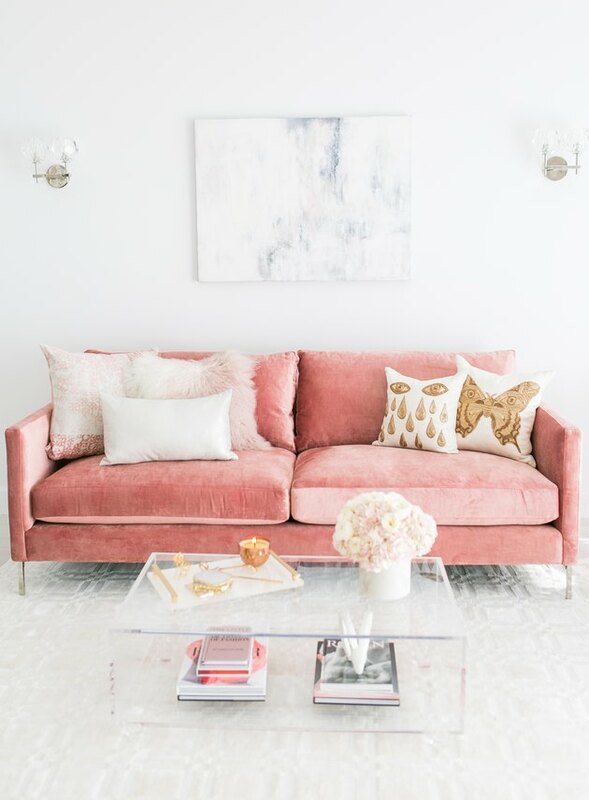 Sydne from Sydne Style completely transformed her living room into a light-filled space by adding a statement-making pink sofa and accompanying throw pillows punctuated with gold motifs. Gold is always a beautiful choice when it comes to choosing a secondary color for a pink-focused living room. 3. Start slowly with pink pillows. 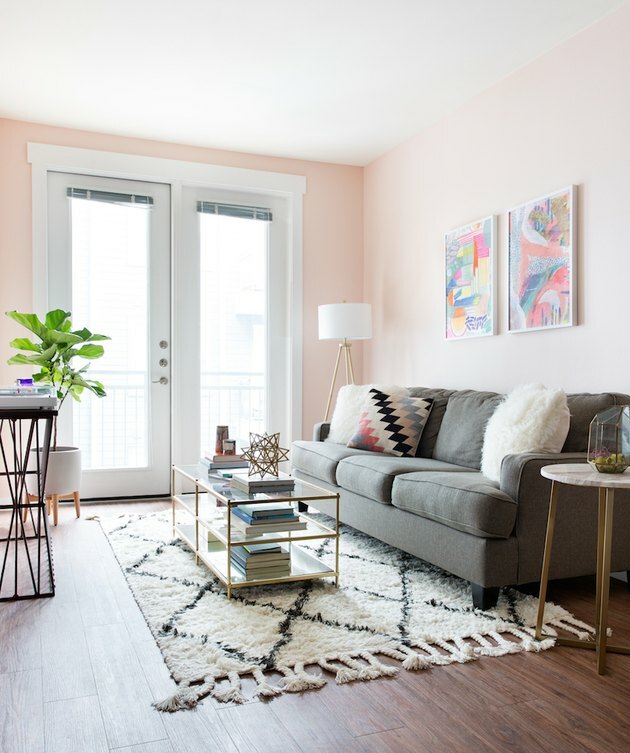 If you don't want to commit to too much pink in your living room, you can always dip your toe into the water with some throw pillows and a blanket, which is what Teresa Caruso of Money Can Buy Lipstick did in her living room. The pillows match up nicely with the subtle rosy hues represented in her gallery wall. 4. Go eclectic with lively colors. At its heart, pink is a fun color, and you can treat it as such in your living room. 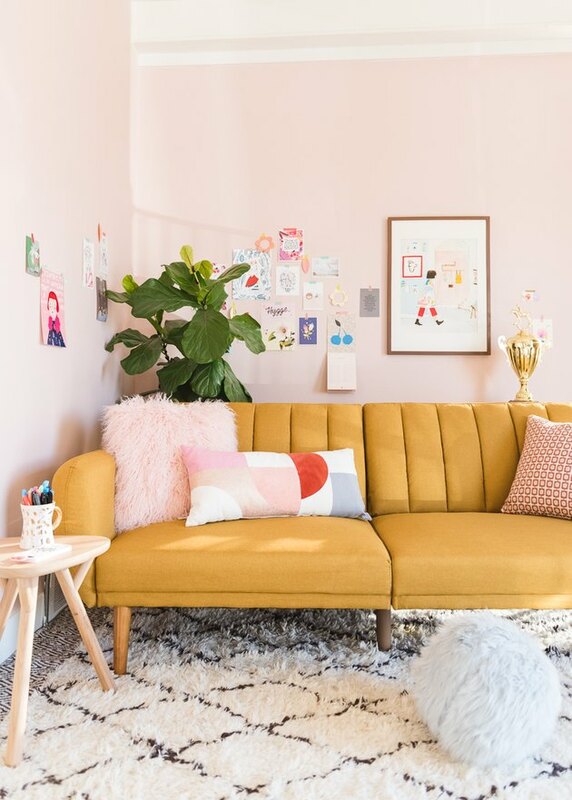 Brittany Watson Jepsen from The House That Lars Built created a joyful living space using cheerful artwork, playful textures, and a maize-colored futon that surprisingly goes perfectly with her pink walls. 5. Weave in vintage-inspired lighting. Pink tends to be a color that's associated with a bygone era (picture all those pink bathrooms that were popular in the 1950s and are back again), and you can pay homage to the timelessness of the trend by pairing pinks with vintage accents. In this living room crafted by Mandi Gubler of Vintage Revivals, she hung vintage-style lighting which partners well with her pretty pink sofa. 6. Bring in pops of pink through stained glass. Want to go all-in on a pink living room? Take a cue from these vibrant windows punched up by Emily Henderson (she made them using gel!). You can either challenge yourself to this DIY project, or have some stained glass installed that of course incorporates bright pink. 7. Create a pretty pink reading nook. Pink looks especially pleasing when it's nestled next to a window that lets in light, which is an ideal spot for a cozy little reading nook. 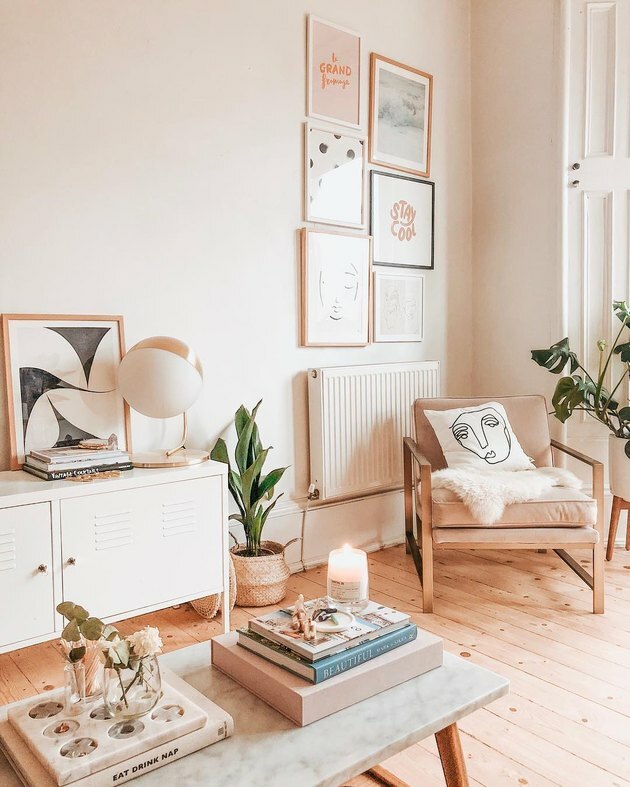 Set one up in your living room and complete it with a pastel pink chair and modern decor accents, which is what Emily Henderson did in this room. 8. Juxtapose pink with black elements. It turns out that black and pink go together like peanut butter and jelly. The two hues work against each other, but in a good way. 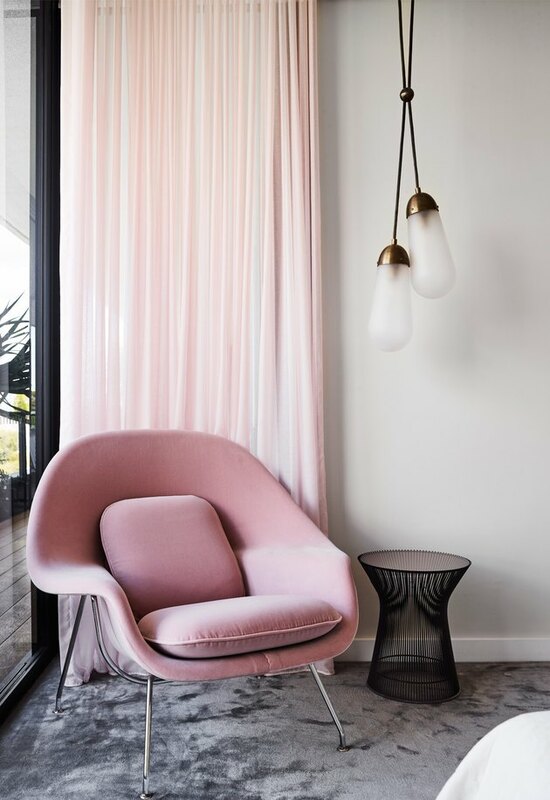 Pink lightens up everything, while black acts as an anchor, as proven in this space belonging to Katie over at Skunkboy. This is an instance when pink can serve as a neutral. 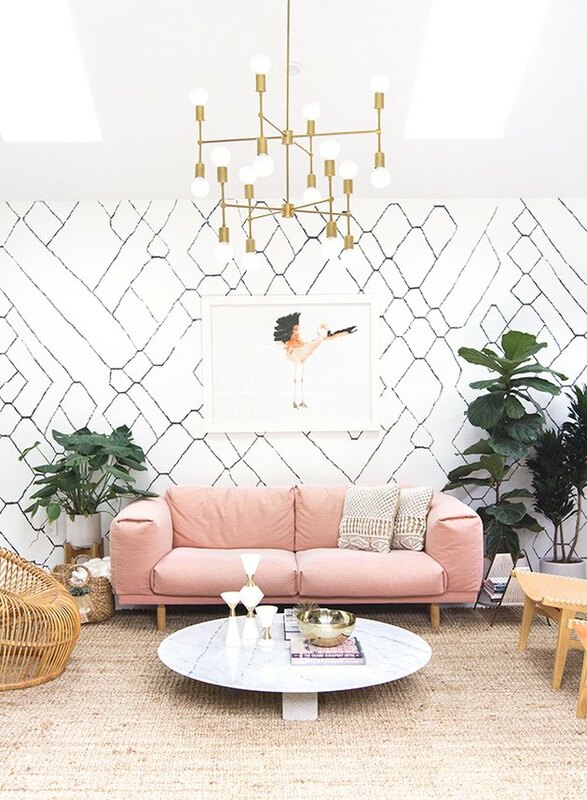 In Sarah Sherman Samuel's studio, a pink sofa is the star of the show and the black and white patterned wallpaper looks completely natural alongside it. The rosy hue is further displayed in the room through a charming piece of wall art showcasing a flamingo. 10. Keep it fresh in blush and white. Another dynamic duo is pink and white, which is seen in the Light Lab creative studio. A custom channel-tufted velvet sofa acts as a luxe centerpiece, while the white brick walls, chairs, and accents all come together to keep things bright and airy. 11. Make pink the focal point of a small living room. Even a diminutive living room can handle a jolt of pink. In this cozy space belonging to Carmen Collins, a coat of paint livens it up without being overwhelming. Pink can also be an oh-so-modern color, if you choose decor that communicates a current feel. 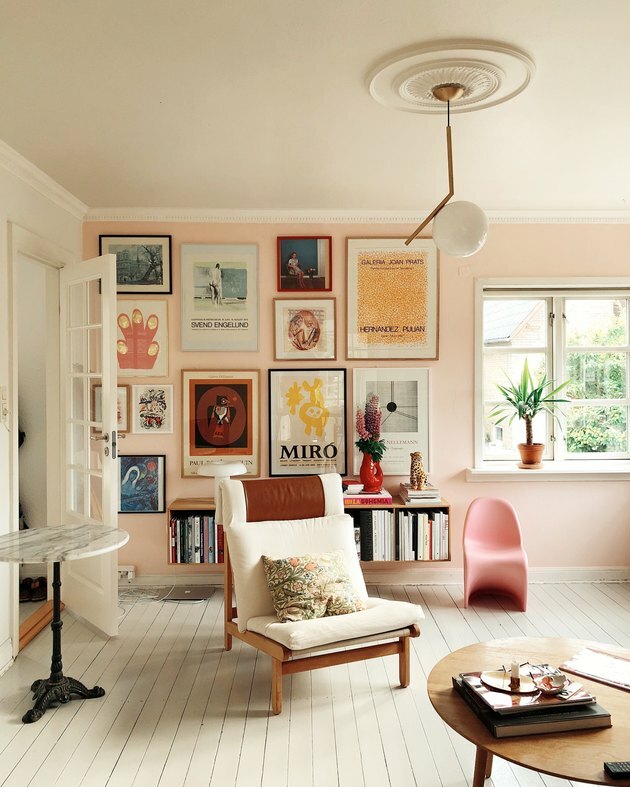 Louise from Mortil Mernee decorated her pink Scandinavian living room with white wood flooring, an artistic gallery wall, and modern furniture. 13. Accent neutral hues with pink elements. Are you usually drawn toward neutral colors like gray, blue, and white? 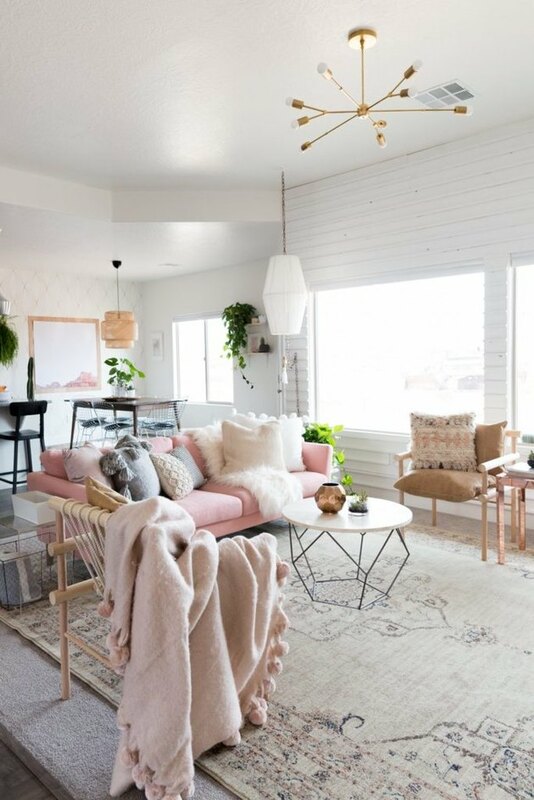 If pink seems a bit intimidating to you, stick to your penchant for all-things-neutral and mix in pinks through pillows, patterned rugs, and woven baskets like Sheeva Sairafi, founder of Local + Lejos, did here. Pink can also be a cozy color, one that might remind you of your childhood room or your favorite blanket. 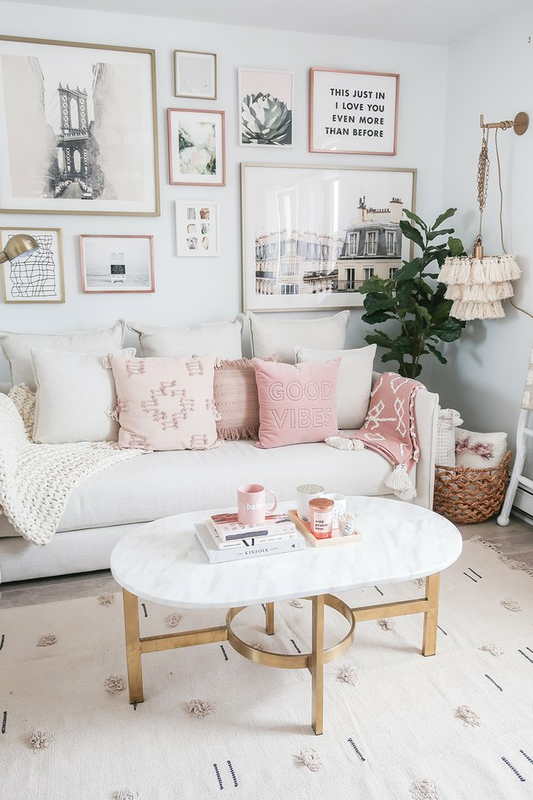 Bianca from French for Pineapple created a snuggled-in vibe in her living room with soft pink pink walls and other plush details. Pink can be a very bold color, and in that spirit, sometimes your space should be very bold, too. 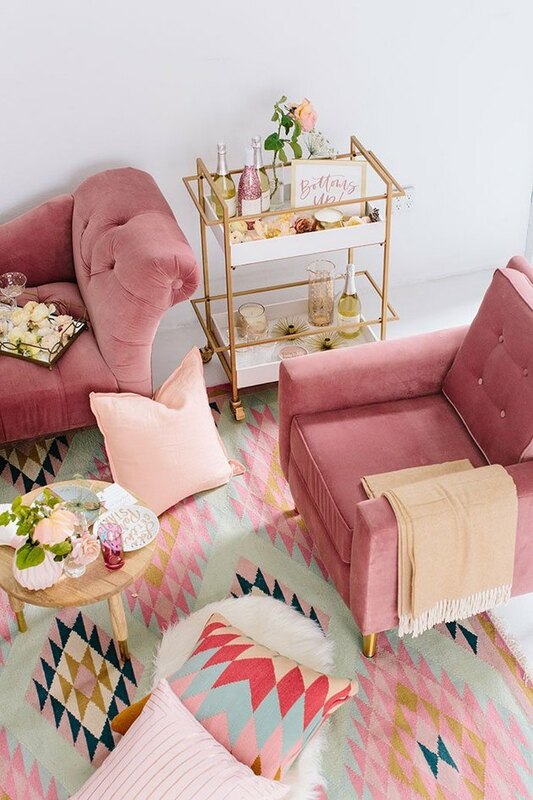 Don't be afraid to outfit your pink living room in kaleidoscopic prints, pink furnishings, and bubbly decor like this space styled by Lulu and Georgia and Beijos. What Colors Go With Light Pink?